Trail rides bring back memories for us. Having gone on more than we can remember, there are still certain insignificant events that come to mind as you see new riders starting out. Saddle bags are a good example. For Christmas one year, Santa brought a set of saddle bags. Although owning some as a child, this was my first set of full size bags. The first chance to use them on a trail ride, I strapped them to the saddle and away we went. It was a good ride and not a bad experience, but I learned using them created more work than I anticipated. These saddle bags were the western style that go behind you and tie to the saddle using the latigo. As you step into the saddle, you have to swing your leg out to clear the bag. The horse I was riding at that time didn’t stand nearly as well as a good trail horse should so getting in the saddle was a little more challenging. The most important thing I learned came the first time I dismounted. My right leg slid under the bag on the right side of the horse. It sort of threw me off-balance and I ended up with my leg stuck until my weight pulled the bag all the way over. Packed full of junk, it weighed enough to temporarily hold me there. I didn’t fall getting to the ground, but it was hardly graceful. I realized any need to dismount in a hurry was going to take some adjustment. No big deal, but anytime I see someone trying out their saddle bags for the first time on a trail ride, I still remember learning these simple lessons. Today there are countless styles, fabrics, colors, and designs. For a short ride, I like the pommel bag that goes over the saddle horn. Easy to access and small, a little bag can be handy for things like cell phones, cameras, or even a bottle of water. The style really depends on your likes. A friend of mine likes the insulated nylon bags. He brings them filled with soft drinks that stay cold most of the day. Before you buy some, see if you can try different types. Using a set for even for just 30 minutes gives you a good idea if you will like them. Most trail riders are more than willing to let your horse carry their bags for a while and no reason to buy what doesn’t fit your needs. First time horse buyers or inexperienced riders commonly have this problem. It is hard for them to understand that horses must respect you or they will walk all over you. As Kivel points out, if you don’t have respect of the ground, you aren’t going to acquire it riding and your training is going to fail. If you want to avoid accidents and problems, make sure you learn how to get the horse to respect you. We believe new riders learn this lesson best in working with a well- trained horse who will likely give a certain amount of respect right from the start. An experienced horse allows a beginner to see how a horse should properly behave. If you’ve never experienced a respectful horse, it is really difficult to know what you should expect. We agree every horse needs to understand the rider deserves to be treated right! In you have never been on a trail ride and want some class room style learning, you might want to consider the University of Michigan’s online equine class room program. According to Dr. Chris Skelly and the university’s web page, Trail Riding 101 is an educational experience based on knowledge from equine experts and nationally recognized equine professionals. The course is intended to help you select the right mount and equipment for the type of trail riding you want to pursue. Some people like to study up before trying new adventures and like the idea of gaining some good ideas before they dive into something. If you want to try a taste of what is offered, there is a free trail riding webcast offered. It gives a nice overview for a first-time trail rider and features equine expert Dr. Jenifer Nadeau from the University of Connecticut. Dr. Nadeau does a nice of job of simply covering a variety of tips and safety issues for trail rides. The webcast is easy to watch and filled with slides so you can easily take notes if you like. If you are considering your first trail ride, spent a half hour and learn before you go. Trail Horses of Missouri, a custom horse trainer says, “We believe that training on the trail is beneficial no matter what discipline you are interested in. A lot of horses are trained solely in the arena, but the first time you get them out on the trail and see a butterfly it may as well be the end of the world! That is why we believe actual trail experience is essential. It teaches your horse self-confidence that will carry him throughout his life . ” We couldn’t agree more. Although they seem to be set up for training a horse you already own, their basic philosophy appears really similar to ours. We don’t train outside horses. Instead we focus on horses ready for the trail for those who haven’t actually made the purchase. 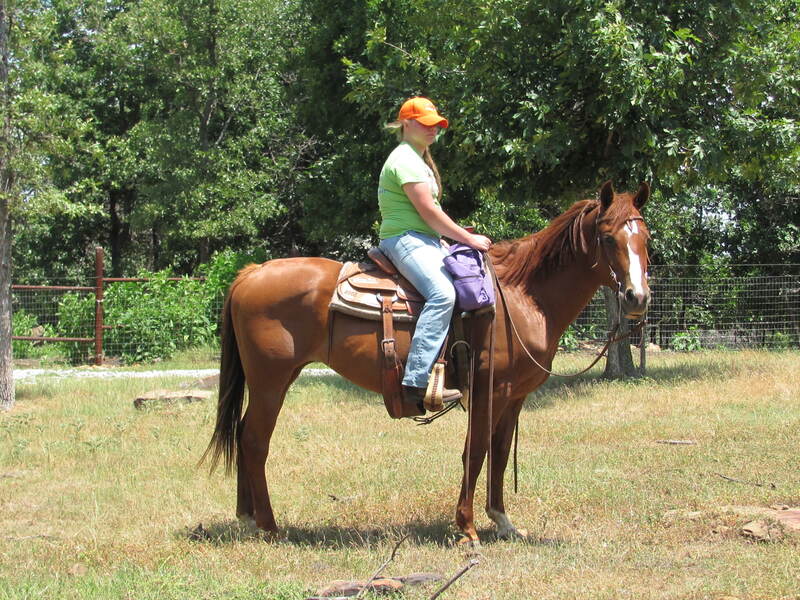 If you already own the horse you want and need help, then finding the right trainer is crucial. You need someone who is confident, kind, firm, and willing to put in the time. There is no substitute for time on the trails or doing ranch work. We liked Trail Horses of Missouri’s policy of only taking a few horses at a time to make sure the horses actually receive the time on the trails. That’s the way it should be done! 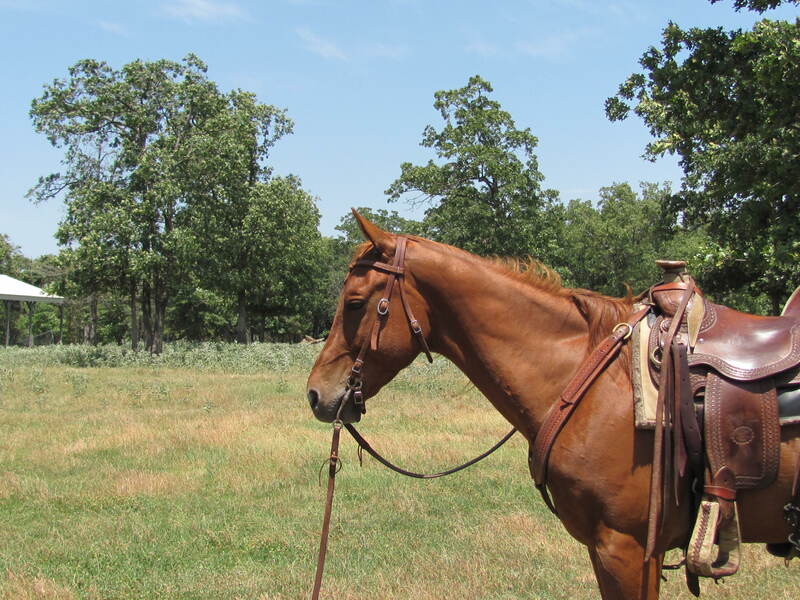 We agree with Missouri Trailblazing’s list of 20 Things to Look for in a Good Trail Horse. The post identifies 20 attributes you would generally find in a good trail horse. We especially agree with the good brakes. You can avoid a lot of wrecks with good brakes. If you have the chance, take a look at their list and check out the rest of the web site as well. We could not agree more. Sound trail horses will do nearly anything and the notion that any horse can hit the trails defies logic and commonsense. You have to spend hours training a horse to run around a ring in circles, but expect him to confront countless new things on the trail without any preparation. Take a look at her article! It is well written and thoughtful. The Pomfret Horse & Trail Association has some good tips for riding out a storm on the trail. In Oklahoma, storms blow up suddenly and unexpectedly sometimes. It is far better to give thought as to how to handle a storm before it happens than figuring it out after it starts. See the article at http://www.pomfrethorseandtrail.com/TrailUse.html. What Breed of Horse is the Best? If you’re wondering what breed of horse is right for you, check out this site! Ground tying is what you see here. You step off the horse, drop the reins, and do what you need. The horse should stand and wait for you. It’s handy when you need to pick up something you dropped or just stretch your legs for a minute. Part of our training is teaching the horse to wait for the rider and not run away. We expect a horse to stand for about 2 minutes without moving. When he does move, we expect him to stick around and not go running back to the barn. Notice the one rein is left draped over the saddle ready for use. If the horse should step forward and break the one rein on a trail ride, you still have one good rein that can be converted into a loop. A good tip for folks new to trail riding. 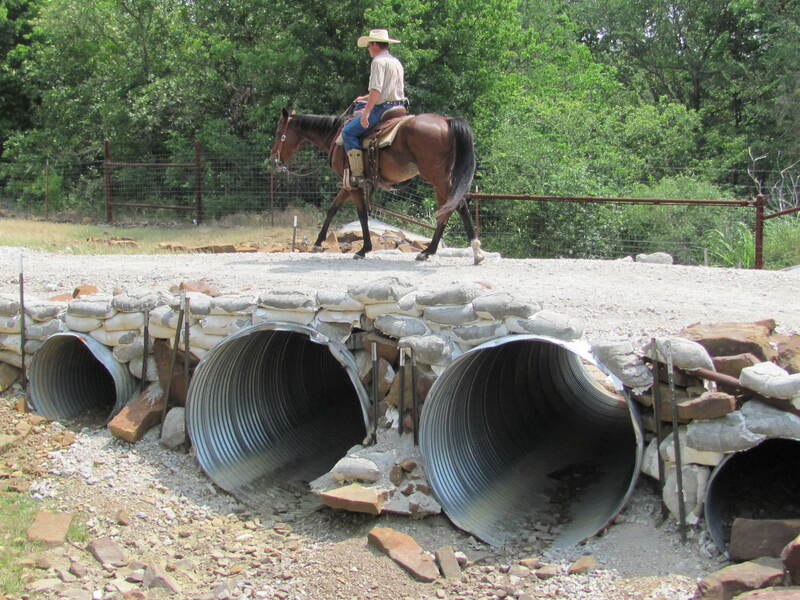 A sound trail horse will cross a bridge without a second thought. The bridge here has caused some inexperienced horses to balk. The don’t like the drop off and really don’t like the dogs that lay inside the pipe in the Summer. Those dogs growling and barking combined with drop sometimes result in a horse turning around. This little bridge with big barking dogs is just one of thousands of scenarios we give our horses in the two-year program. Every horse that passes will cross bridges, creeks, water, and all types of obstacles just like this horse, quiet, relaxed, and calm. What Breed Makes The Best Trail Horse? We agree with Ms. Judy Smith that there is no one ” best breed “ for a trail horse. Check out her video. An experienced trail rider, she recognizes the most important attributes are willingness to go wherever the rider wants in a safe manner. One difference is our preference for the American Quarter Horse even though any breed will work. We like the quarter horse especially for beginners who have reached more mature ages. Although not gaited like some breeds, the quarter horse offers a smooth ride at a slightly slower pace. New trail riders need to have time to react to situations. You are currently browsing the horsesfortrail blog archives for June, 2012.